Consider The Columbus Organization approach to person-centered care coordination when you are looking for a partner in your journey. At The Columbus Organization, “person-centered care” isn’t just a checklist and a process. We put every individual with intellectual or developmental disabilities at the heart of what we do because everyone deserves a meaningful life. The Columbus Organization has been in business for more than 30 years and we have served over 10,000 individuals with intellectual and developmental disabilities in 42 states. 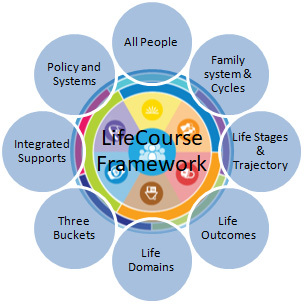 We believe and follow the Charting the LifeCourse Framework. This means we center the care around the individual to ensure your family member with an intellectual or developmental disability has the opportunity to live a meaningful life. We assess not only immediate physical and behavioral needs, but we also consider them within the framework of a full and meaningful life. *Charting the LifeCourse and LifeCourseTools.com is a project of the University of Missouri–Kansas City Institute for Human Development, Missouri’s University Center for Excellence in Developmental Disabilities Education, Research and Services (UCEDD). The Columbus Organization provides care coordination services for many needs. We have a staff of medical, psychosocial, therapeutic and administrative to offer a full range of services whenever and wherever you need them. For individuals and families challenged with an intellectual or developmental disability, the search for quality care coordination can seem like a daunting process. With thousands of individuals supported by The Columbus Organization, we provide a long history of success and the peace of mind that families are supported by a trusted and reputable organization. In addition to Traditional Care Coordination, we also offer Intensive Care Coordination and other services to assist individuals in achieving the most full and meaningful life. For individuals and families that need a higher level of service, we can help you manage your challenges. Our Intensive Care Coordination includes all of the components of Traditional Care Coordination, but the activities reflect specialized coordination of waiver, medical and behavioral support services for individuals with exceptional medical and/or behavioral needs. The Columbus Organization ran a pilot program with the state of Georgia in 2016 to develop their intensive waiver program, which was submitted to The Center for Medicare and Medicaid Services and then approved. This pilot was called The Pioneer Program and set a new standard for intensive care coordination in the state. We work with individuals through advocacy, education, communication, identification of service resources and service facilitation resulting in fewer hospitalizations, disruption of services or need for more restrictive placement.